In every business there are processes that must be carried out the same way each and every time. aACE Task Groups allow you to create templates for your standard workflows, helping to ensure that your operations run smoothly and according to schedule. 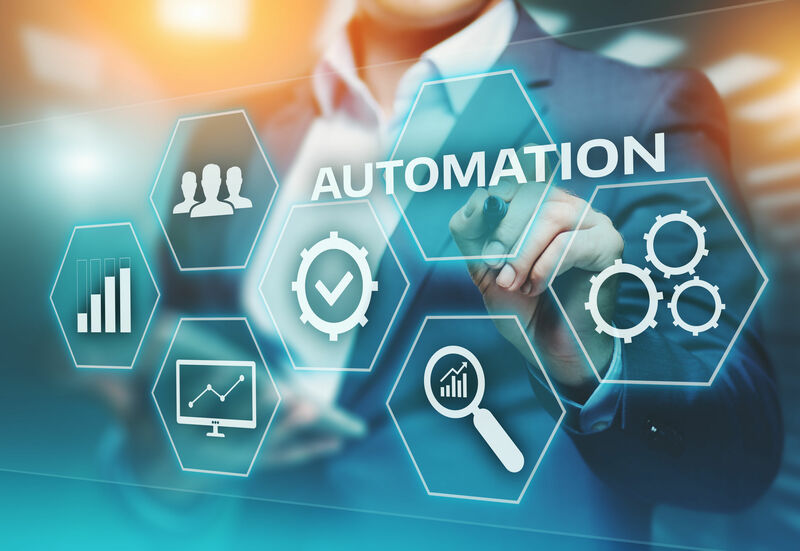 And if one step in your process is delayed, aACE’s Task Anchoring feature automatically shifts the rest of the tasks to accommodate your new timeline. 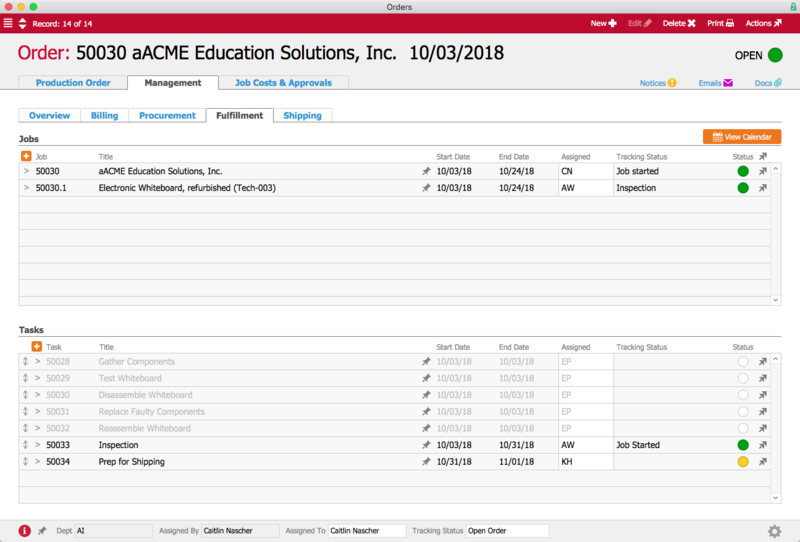 To learn more about Task Groups, let’s take a look at how our fictional company, aACME Education Solutions, uses them in their day-to-day business. aACME Education Solutions refurbishes electronic whiteboards for use in schools and college classrooms. Because these whiteboards aren’t being sold new, each one goes through rigorous repairs and inspections—and it’s vital that each step is followed to the letter. That’s where aACE’s Task Groups module come in. 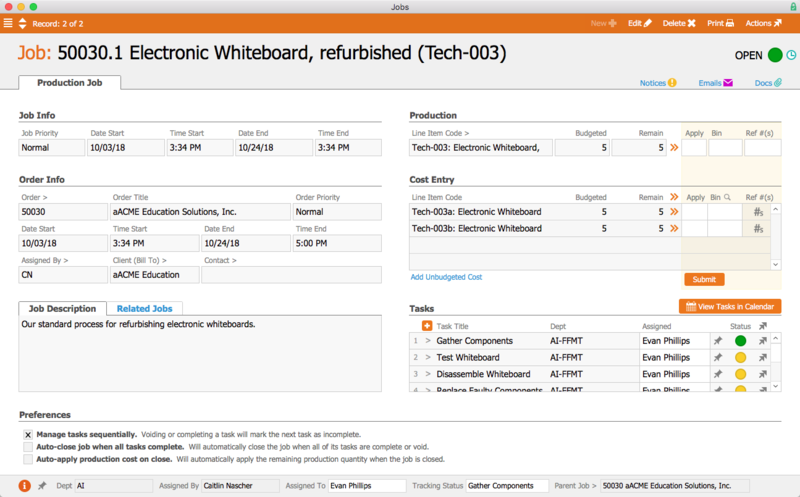 When a production order for the refurbished whiteboards is opened, aACE automatically generates a job associated with the order. 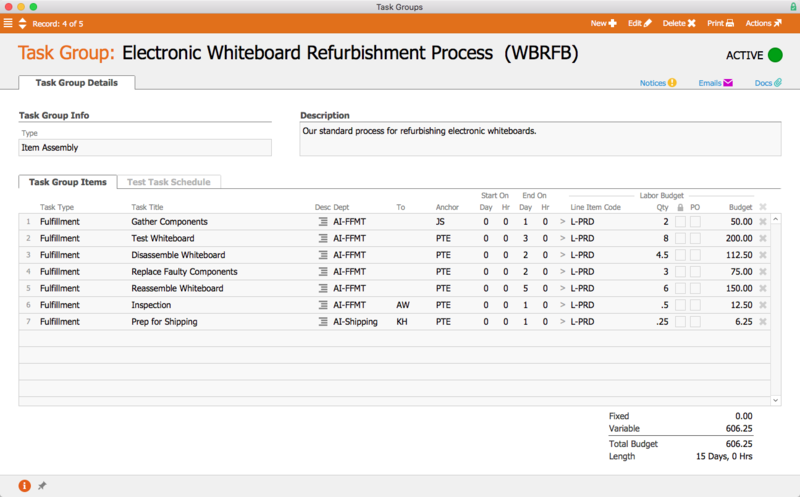 Because the “Electronic Whiteboard Refurbishment Process” task group has been linked to the Refurbished Electronic Whiteboard line item code, the job is automatically populated with a pre-set list of tasks as specified in the task group. The first task, Gather Components, is configured to begin as soon as the job is opened. Tasks can be assigned to either a department or a specific user; because this task has been assigned to the Fulfillment Department, aACME’s Fulfillment Manager Evan Phillips is automatically assigned to the task. On the production floor, Evan can apply time and materials to the task using the aACE Job Shop app. In the task group, we can see that this first task is set to end one business day after the job starts. Two hours of labor have been budgeted for this task, and it has been assigned the line item code L-PRODUCTION. That is the line item code to which Evan’s time will be applied when he works on this task. When Evan marks the task complete, the next task, Test Whiteboard, will automatically begin. 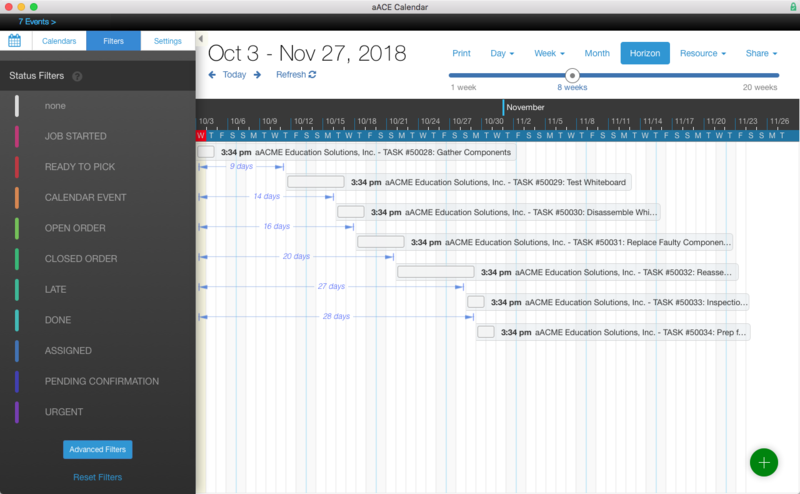 In the aACE+ DayBack calendar, we can see that all of the tasks associated with the job have been scheduled according to the amount of time they were allotted in the task group. But what if troubleshooting the whiteboards takes longer than expected? aACE’s anchoring features make rescheduling a snap. Because each task is set to begin only when the task before it has been completed, moving the Test Whiteboard task up a week will also move all of the tasks after it by the same amount of time. When the production team has finished the whiteboards, they need to be inspected. This task has been assigned to Allen Wright, aACME’s Quality Control Officer; when he’s ready to begin, the task will appear in his Tasks module with a green status indicator. 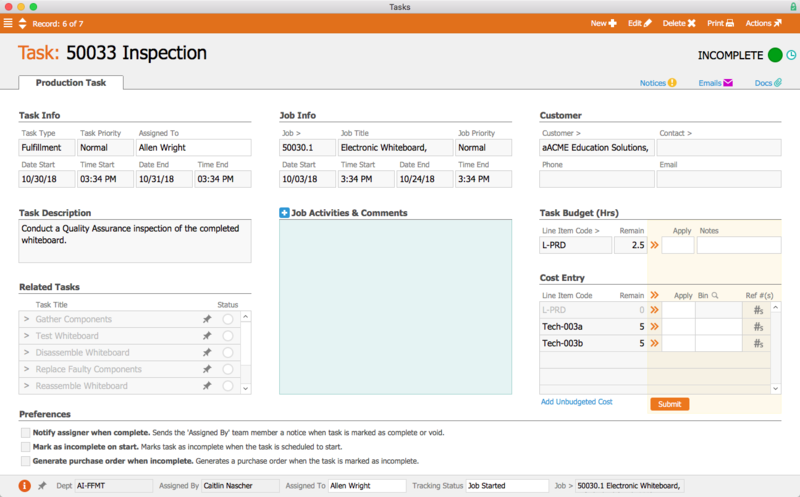 In the task’s detail view he can view related tasks as well as apply time and materials to the task. He can also leave comments and activity notes that will appear in all task records associated with the job. If the manager who placed the order wants to check in on how it’s progressing, the order’s Fulfillment tab shows which tasks have been completed, which tasks are in progress, which have yet to start, and when they are all scheduled to begin and end. Gone are the days of following up with other departments to find out when a job is going to be done—aACE provides all of that information at a glance! Now that we’ve seen how aACE’s Task Groups work for our fictional company, take a look at our Gable success story to learn more about how this feature has helped a real aACE client better track their orders. Discover even more ways that aACE works for everyday businesses when you check out our other success stories below. "aACE transformed our order fulfillment process during implementation by helping us see trouble spots in our processes."